Fissure sealants are used in order to protect your children’s teeth in a safe and painless way. The sealant is a plastic coating which creates a hard shield. This coating prevents food and bacteria from sticking to the small grooves in the back teeth. The coating is only applied to the back teeth since most tooth decay in children occurs in those teeth. What is the procedure for a pit and fissure sealant? 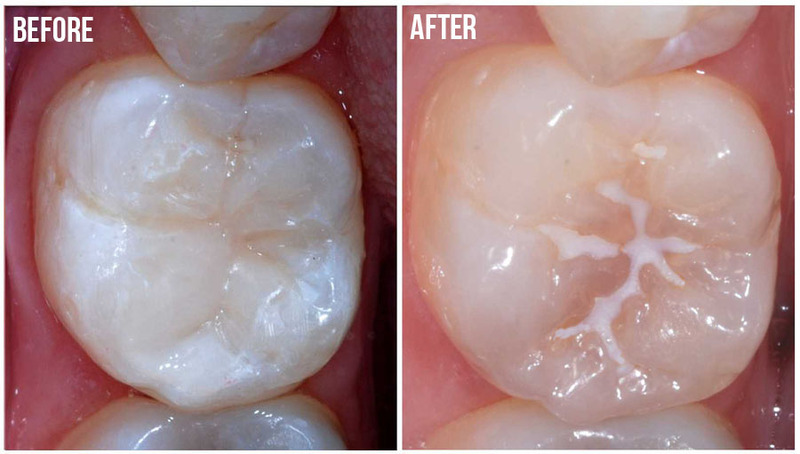 The procedure for a fissure sealant is very simple and only takes a couple of minutes. It varies slightly depending on the type of sealant and manufacturer being used but will be similar to that described below. Your dentist, therapist or hygienist can perform fissure sealants. Sealants protect the occlusal surfaces, inhibiting bacterial growth and providing a smooth surface. This increases the probability that the surface will stay clean. The ultimate goal of fissure sealants is penetrating into the pit and fissures of the tooth and sealing them from bacteria. The sealant is only applied to the back teeth – the molars and premolars. These are the teeth that have ‘pits’ (small hollows) and ‘fissures’ (grooves) on their biting surfaces. Your dental team will tell you which teeth should be sealed after they have examined them, and checked whether the fissures are deep enough for sealing to help. Some teeth naturally have deep grooves which will need to be sealed; others have shallow ones which will not need sealing. Traditionally, sealants are thought of as a preventive measure for children and teenagers when they are in their “cavity prone years”. Patients who have xerostomia (decreased salivation); are undergoing orthodontic treatment, show evidence of incipient caries, or who are prone to caries should be evaluated as candidates for sealant placement. Primary molars also can benefit from the placement of fissure sealants.